To truly appreciate the beauty of Côte d'Azur, also known as the French Riviera, you need a car. But if you don't have a "Telepass" (similar to EZ Pass in the US), expect to wait a while in toll booth lines. I am not a road designer/engineer, but I have to say that these toll booths are placed way too close together and seemingly in random locations. They slow down the flow of traffic tremendously. 4 Euros and 40 Cents for driving on a highway for less than 30 mins!! In any case, this still should not discourage travelers in south of France from renting a car to be able to see the incredible sights at your own pace. Just be prepared to encounter many random toll booths, occasionally with long lines, and in some instances with slightly unreasonable toll fares. The Italian toll booths are much better placed, in the sense that you take a ticket when you get on the highway, and you pay a toll when you leave the highway, even if you transfer multiple highways in between. More on this and the Italian roads later. We decided to not take the GPS suggested route all the way to Cannes (fastest route), but instead deviated to check out the coastal roadways, also known as Corniche de L'Esterel. This added about an hour to the duration of our trip, but the sights were well worth the delay. As you drive down Corniche de L'Esterel, you have red rocky mountains to your left and the gorgeous blue Mediterranean Sea to your right. There have been so many times on this adventure where I have said pictures really do not do the scenery justice. This was definitely one of those times. Once we arrived in Cannes, we parked our car in a garage. It is a much quicker and safer option than looking for a spot on the road. The rates at the garage were not unreasonable, and our car was nice and cool when we returned from seeing the town. What you will find while traveling through the French Riviera are lots of shop keepers and waiters/waitresses that know English quite well. However, don't expect the English speaking shop keepers or the waiters to be bubbly and friendly. I love the French, their art, their culture, and their language, but they really are not the friendliest people we've come across. This is one stereotype we have definitely found to be mostly true, though of course with some exceptions. After grabbing a quick bite, we checked out a nearby beach very quickly, as we still wanted to check out the town and make it to Nice before dinner time. The beaches in Cannes are sandy (unlike the rocky beaches in Nice), but they are very tiny (the distance from the water to the rocks/stairs going back up to the street is less than 30 feet in some places), albeit there are quite a few tiny ones sprinkled along the coast. After the beach, we took a nice walk through town. We walked up Rue du Mont Chevalier, which brings you to Suquet Hill, which offers a high and panoramic viewing point where you can see the city, the marina, and the beaches quite well. I should probably mention that the walk up the Suquet Hill is quite steep with some stairs a long the way. This reminded us a bit of walking around in San Francisco. At the top of the Suquet Hill, we also visited the Church of Notre-Dame de l'Espérance. 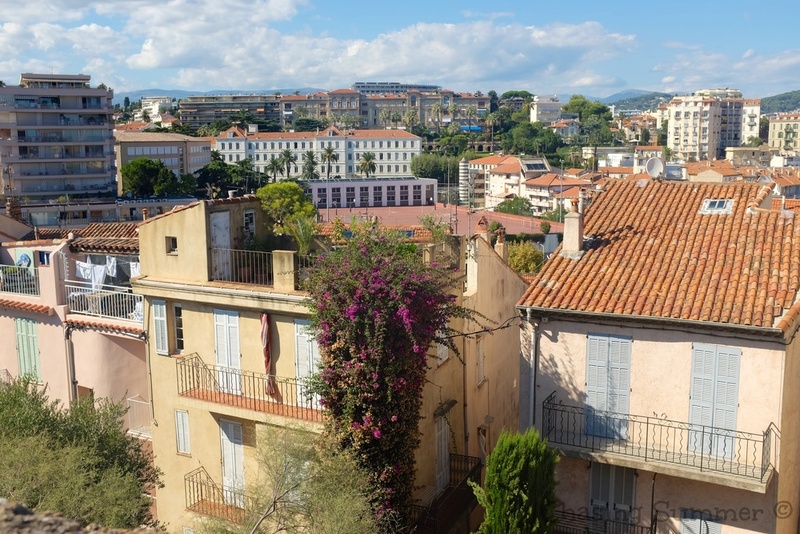 "Built in the 16th century by the monks of Lérins, Notre-Dame de l'Espérance and its recognisable clock tower have become the symbol of Old Cannes". Cannes also has a very Hollywood / Beverly Hills feel to it, mainly due to the well known Cannes Film Festival. "Founded in 1946, it is the most prestigious and publicised film festival in the world. The invitation-only festival is held annually (usually in May) at the Palais des Festivals et des Congrès." We had to check out Palais des Festival before leaving the city. On our way, we saw a great painting of Cinema Cannes on the side of a building. If you click on the image to enlarge it, you will find lots of familiar faces. My favorite, for some reason is the painting of the moon from Georges Méliès's movie, Le Voyage dans la Lune. Unfortunately, the red carpeted stairs leading to the famous Theatre Claude Debussy was packed with lots of people posing for cameras. "Stars posing for photographers are a part of Cannes folklore." We did not see anyone famous in Cannes, but we had lots of little laughs as we watched people make exaggerated actor/actress poses for lengthy photo shoots from their friend's/family's cameras. It's a bird. It's a plane. It's Super Kian! With the beach, panoramic views, and Palais des Festival off our check list, we headed back to the garage to continue our journey to Nice. It was only about a half hour drive, and we were all getting quite hungry. Given the option, we try not to eat at the hotel, as the food at most is much more pricy than similar quality food from normal restaurants. So after checking in, we went for a little walk and found a nice place to sit down and eat. Tomorrow we plan to explore Nice, drive through Monaco, and hopefully make it to our hotel in Florence before 10 PM.